Activated charcoal works with a technique known as at adsorption; it draws certain toxins to itself and inactivates them prior to elimination by the body. It is commonly used to treat many cases of poisoning and drug overdoses, but there are many more benefits of consuming Activated Charcoal. One use of activated charcoal is to treat intestinal gas. It does this by binding to the metabolic products produced after consuming foods. While the production of gas is normal, certain foods are known to cause excessive gas production and result in discomfort. Activated charcoal may help with inactivating additives in alcohol and help absorb some of this from the liver. 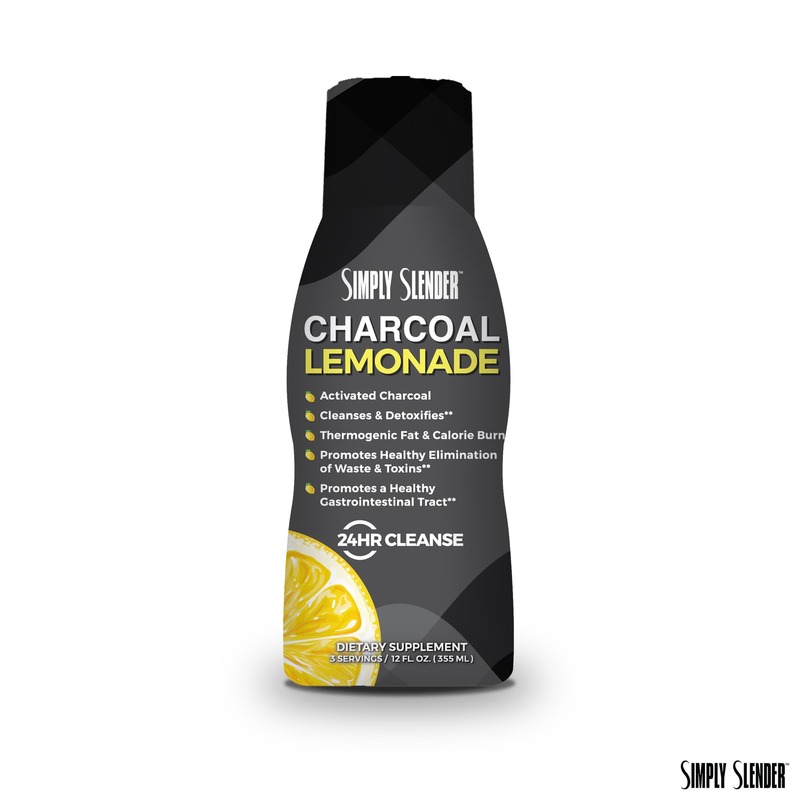 Drink Simply Slender Charcoal Lemonade after a night of excess, and you will most likely wake up feeling a lot better! 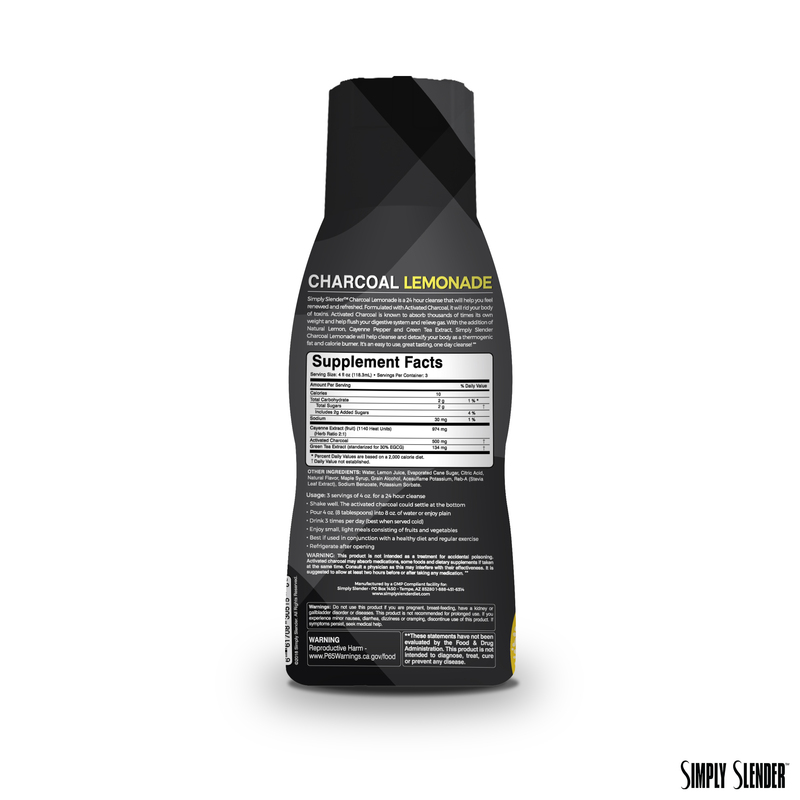 Because of adsorption, Activated charcoal binds to toxins in the intestinal tract and helps you eliminate toxins with elimination. This process is quicker than the body's natural cleansing process. I loved being one of the first ones to try this! I did this lemonade cleanse about a week after I did the Simply Slender Master Cleanse and I loved it. Great taste. As soon as the bottles hit stores, I will be buying more. Great for anyone wanting to jumpstart their diet or just help detoxify along the way! Thank you for the free bottle! Great product! Love the charcoal lemonade! No side effects and no hunger headaches! Plus one day detox makes it easier! I just tried this after a Sunday Funday where I drank and ate way too much. Not only did I feel lighter and less bloated, it really helped with my hangover too! I will so be using this cleanse again and again! I loved this product! I purchased after my vacation as I knew i was going to eat lots of rich and greasy foods! It not only helped flush my system, but it relieved bloating and tasted great! I will definitely be purchasing this again! I use this to cleanse and get back on track with clean eating. It seems to work and has a pleasant taste. Decent product for the price. Used it on a Saturday, trying to eliminate toxins. Pleasant taste. Goes down easy. Probably need to use it more than one day, but I did feel better after using it. I’m always hesitant of trying beverages that “detox" my body, because sometimes the results are harsh. But, since a friend recommended it, I tried it. Benefits from this: 1) It doesn’t taste bad, 2) It made me less hungry, and 3) I felt lighter and less bloated. Definitely something I’ll purchase again. The taste isn’t very good but the drink itself does what it’s supoosed to do. Great cleanse- tastes good too.